Rodney Odean Bartels, 49, a resident of North Fond du Lac, passed away at home on April 1, 2019. 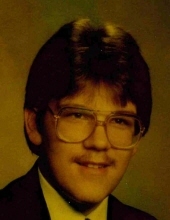 Rodney died after a long and painful struggle with Progressive Multiple Sclerosis. Rodney was born in Tomah, WI on January 21, 1970 to parents, Vernal and Patricia Bartels. Rodney graduated from Winnebago Lutheran Academy in 1988 and went on to UW-Platteville to study communications. He moved to Appleton after school in Platteville. Rodney was an events promoter and managed BDR Promotions. He had numerous friends in the music business.Rodney was an active member of the Sons of the American Legion. He enjoyed music, his cats, movies, listening to his sister’s adventures and travelling extensively throughout the states. Rodney is survived by his mother, Patricia, and his sister, Verna of Fond du Lac. He was preceded in death by his father, Vernal, grandparents, aunts and uncles. Visitation: The family welcomes relatives and friends for a time of visitation at the Zacherl Funeral Home, 875 E. Division Street, Fond du Lac on Friday, April 5, 2019 from 3:00 to 5:00 PM. Cremation has taken place. Rodney’s family extends special thanks to the EMTs, Fond du Lac Fire Department and Fond du Lac City Police Officer Rochne West for their efforts. "Email Address" would like to share the life celebration of Rodney O. Bartels. Click on the "link" to go to share a favorite memory or leave a condolence message for the family.